It has been our privilege to be part of the Oswego, Sandwich, Montgomery, Yorkville, Plano, Sugar Grove, Plainfield, Naperville, and Somonauk IL communities since 2001. Our goal is to have quality products, responsive service and competitive pricing. 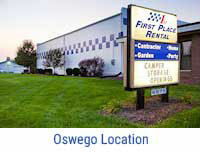 With two locations to serve you, we provide a quick and convenient way for you to get what you need, when you need it. Not only will you rent professional quality equipment, but you will benefit from a team of knowledgeable rental professionals that can assist you in choosing the best equipment rentals you need for your job. Scott Munsterman, the owner of First Place Rental has over 35 years of rental industry experience in the the Western Chicago Suburbs. First Place Rental is an equipment rentals and tool rentals center that offers a wide array of homeowner and light contractor equipment including Bobcat skid steers and mini excavators. In our expansive rental inventory, you will find a resource for tools to help remodel, expand or renovate your home, garage and yard. We hope you will take time to browse through our rental equipment categories and get a feel for what is available to help you get your project accomplished. We also sell and repair equipment, and offer a wide variety of parts and supplies. We are a Honda Premier Service Dealer, stocking mowers, pumps, generators, and more. For your convenience, all equipment may be reserved through our online computerized reservation system by using the web quote option or calling us directly.